I’ve been putting off writing this for a while, but today I really have to do it. The above quote is the truth. Sometimes I wonder, if I had known how hard it would be, would I have still chosen to go down this path of independent international adoption? Donnie and I have had this discussion more than once. If I’m honest, I don’t know that I would’ve gathered the courage to do it, had I known how hard it would be. The timeline is at least twice as long as we predicted. I naively thought she’d be here before winter ended. We’re now racing toward July and I don’t have any real end date in sight. We’re now facing the possibility of hiring a new attorney, which means starting all over again with some of the processing and redoing our home study, which expires in August and costs a lot to renew. It also means, at the end of the day, doubling our original estimate of $3000 for legal expenses. Because of that and other issues, the expenses keep compounding, and I am NOT at all a salesman or fundraising person at heart. I despise asking people for help. It’s truly one of the hardest things I’ve ever had to do. I dislike every bit of it–the selling, dealing with crazy people on eBay, baking in the heat at yard sales and having people grumpily pay me pennies for things that are worth much more, posting reminders to buy coffee or cakes or jewelry on Facebook. Basically, begging. God has definitely set me outside my comfort zone in that regard. I get so weary of being asked how the adoption is going, and I know that most people only want a short answer. But trying to explain it all is like trying to summarize “War and Peace” in a couple of words. You just can’t do it. And people who aren’t familiar with international adoption don’t really understand the process anyway, so it’s hard to know how to explain our current issues. In retrospect, I’d have changed so many things. I wouldn’t have let Pearl know about our intentions as soon as we did. This lengthy process has been so incredibly unfair to her. I wouldn’t have chosen a lawyer based on just a few glowing recommendations of people in-process with him — I’d have sought out multiple opinions by people who were already back home with their children. Actually, I think I’d go with an agency instead of independent adoption, too. But there wasn’t really any way to do that, in our case, given how we knew Pearl. Today, I found out they’ve set a new requirement to clear court in Kampala: a private investigation into the orphan’s family history and background. They’ve just started requiring this because of the fraud in Ugandan adoptions. Apparently, the corruption isn’t limited to cases involving babies and toddlers — even older kids are being coached to lie about their family situations. It’s all over the news right now in Uganda, from what I hear. Even though the government’s probation officers (social workers) have already conducted their investigation, the judges (and the American embassy) now want to see a separate private investigation done as well. I understand why, but still…that’s $2,000 more — and I will be beyond shocked if Pearl’s story doesn’t turn out to be true, because I know people who’ve been there and verified it. Like my mama always said, a few people doing wrong can ruin things for everybody; sometimes you’re the one who gets punished for someone else’s crimes. It seems like every time I think I know how something is going to go, something else happens. And I fear that we’ll be stuck in this limbo forever, with nothing lining up or working out. Realistically, of course, I know that’s not the case — nothing ever stays the same. I’m just sharing how it feels. A younger Donnie, a younger me probably would’ve said “no” to all of this, had we known in advance. The trouble is, we’re older and have the life experience to know that the hardest things in life are usually worth it in the end. And all of us have already bonded with this sweet girl, and she, with us. So, there’s no quitting now. We have three amazing boys and they didn’t come easily, either, their journey to us marked by years of infertility, miscarriages, one son nearly dying at birth and me having serious complications during or after all three pregnancies. Now on the other side of it, these kids are such a blessing, I’d do it all again and more. But had I known ahead of time, would I have signed up for all of that? I don’t know that I would’ve had the courage to say “Yes” if I’d known. I’m sure this is the same. A year from now, I’ll probably be braiding her hair and thanking God for pulling us through. I feel guilty even asking anyone to lift up more prayers for us, because they’ve already given their time in prayer, and so much more. 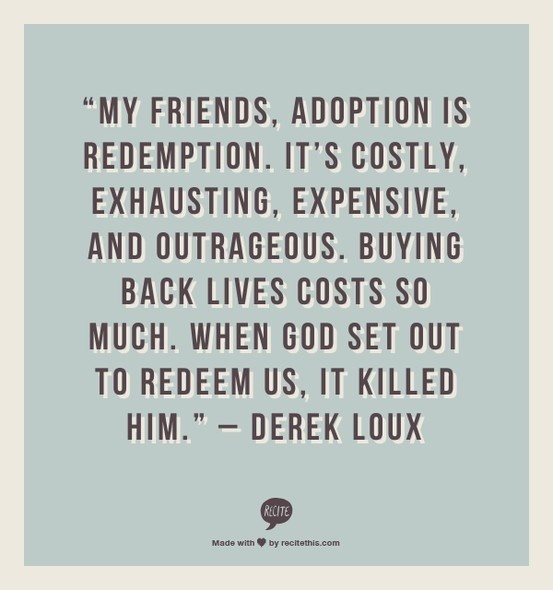 It’s definitely a costly, exhausting, expensive, outrageous thing, this process of redemption. That’s such tough news to get! We’re praying for peace and patience during this long journey!